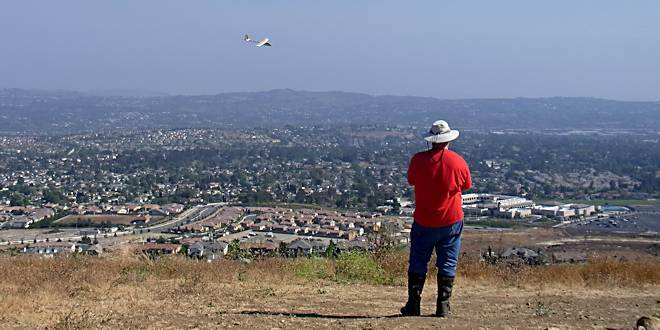 Glider Point is within the boundaries of the Chino Hills State Park and the Park Service will usually close the park to public access for a few days after measurable rain in order to limit road and trail damage. A S wind works best but slope is flyable in a SSW to SSE wind. W0PE-1 Yorba Linda (MesoWest), 0.5 mi S of slope. DW6637 Yorba Linda (MesoWest), 2 mi. SW of slope. 400′ slope with some good lift. Ample LZ behind slope. Go N on Yorba Linda Blvd. for 2.6 mi. to Village Center Dr. and turn RIGHT. Go N on Village Center Dr. for 1 mi. to Fairmont Blvd. and turn LEFT. Go W on Fairmont Blvd. for 0.3 mi. to Rim Crest Dr. and turn RIGHT. Go N on Rim Crest Dr. for 0.4 mi. to Blue Gum Dr. and park in the corner. Walk N down the dirt path in the corner to the tee and turn LEFT. Walk W up the path 0.3 mi. to the flying area. 33.87096, -117.74493 • Junction of SR-91 & Yorba Linda Blvd. 33.89088, -117.77688 • Junction of Yorba Linda Blvd & Village Center Dr.
33.90354, -117.77130 • Junction of Village Center Dr. and Fairmont Blvd. 33.90463, -117.77628 • Junction of Fairmont Blvd. and Rim Crest Dr.
33.90883, -117.78049 • Corner of Rim Crest Dr. and Blue Gum Dr.
33.90903, -117.78744 • Flying site.